The healthcare and medical travel sector in Mauritius is experiencing sustained growth and has attracted significant domestic and Foreign Direct Investment (FDI). The sector is gradually becoming an important contributor to economic growth. According to the Bank of Mauritius figures, FDI has increased in a sustained manner in the healthcare sector over the last 5 years, Rs 2 million in 2006, Rs 29 million in 2007, Rs 120 million in 2008 and Rs 145 million in 2009. Based on the 2010 edition of the annual private healthcare industry survey conducted by the Board of Investment, medical travel is experiencing a healthy growth. In fact, the number of foreign patients seeking medical care in Mauritius has increased from a mere 1,000 in 2005 to more than 10,000 in 2010. Mauritius has a well-developed medical devices industry manufacturing a wide range of quality products. Leading industry players from Europe like Johnson & Johnson, Carl Zeiss Inc., Laboratoire Perouse and Natec Medical have set up their production units in the country with an annual turnover exceeding Rs 1 billion and employing more than 500 people. The pharmaceutical sector is becoming self-sustaining as the sector continues to grow and is tagged for long-term expansion and further development. Over recent years, global pharmaceutical companies like Ajanta Pharma and Mascareignes Pharmaceutical Manufacturing have started operations in Mauritius employing some hundred people and are engaged in the production of antibiotics, anti-cholesterols, anti-malarials, antipyretics and pain killers exported to African countries and the rest of the world. The Republic of Mauritius, an island country in the Indian Ocean, lies east of Madagascar and the south-east African coast. Its nearest neighbour is the French island of Réunion. 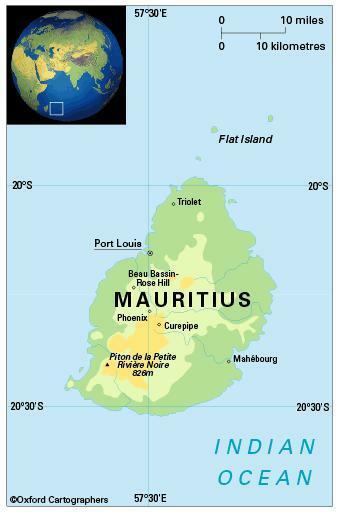 The Constitution of Mauritius provides that Mauritius includes the islands of Mauritius, Rodrigues, Agalega, Tromelin, Cargados Carajos and the Chagos Archipelago, including Diego Garcia and any other island comprised in the State of Mauritius. Mauritius has always maintained that it has sovereignty over the Chagos Archipelago but has not been able so far to exercise its sovereignty. The climate is maritime subtropical, with south-east trade winds blowing for much of the year. Summer, the rainy season, is from November to April, winter from June to September. Rainfall ranges from 80 mm in October to 310 mm in February. Heavy rains fall mainly from late December to the beginning of April. Cyclones, occurring in the summer, occasionally do severe damage. Environment: The most significant issues are water pollution and degradation of coral reefs. 1,240,000 (2012); 42 per cent of people live in urban areas. The population growth rate stood at 0.7 per cent p.a. between the years of 1990 and 2012. In 2012 the birth rate was 12 per 1,000 people (28 in 1970) and life expectancy was 73 years (62 in 1970). About 68 per cent of the population is of Indian descent, 27 per cent Creole and the remainder largely of Chinese or French descent. Mauritius is classified and as an upper-middle-income economy by the World Bank.